The Indian Railways department is making it simpler for netizens to book tickets online with the introduction of a redesigned IRCTC ticket booking experience at midnight today. With the new design, which is already available to try out, the IRCTC website has finally shed its cluttered layout and now falls in line with modern standards. The ticket search feature is now available right on the homescreen and is accessible even without logging into an IRCTC account. This is the biggest change right off the bat and makes the overall experience a lot simple and smooth for new users. The updated platform has also been designed to play well with many different devices including mobiles, desktops, laptops, and tablets. I have toyed around the new website for a quite a bit and it looks good compared to the previous design. However, the biggest feature addition comes in the form of a ‘Forecast Confirmation Probability’ feature that will enable users to know the probability of a wait-list ticket getting confirmed before they book a ticket. 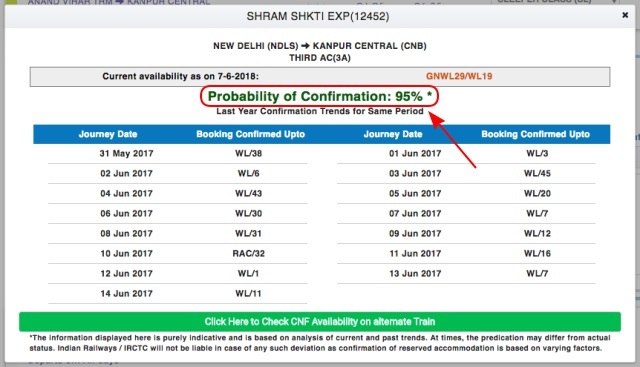 The IRCTC website has deployed a new algorithm, which has been in the works for more than a year, that will show the probability in terms of percentage for each day. IRCTC is using data from the last 13 years to power this feature and boasts that it’ll provide users with the most robust and accurate predictions. According to the new feature of wait-list prediction, one can predict the chances of a wait-listed or a RAC ticket getting confirmed on the basis of booking trends. We will mine our own data of passenger operations and booking patterns for the first time. Just like always, IRCTC’s new website has been created by the Indian Railways software arm Centre for Railway Information Systems (CRIS) and several other features have also been added to the mix. While booking a ticket, you’ll now get separate cards to fill out every passenger’s details, pre-filled particulars for quicker checkout and an option to choose six banks as preferred banks in the payment section. The booked ticket section has also bagged a facelift and is now going to let you perform various actions. Users can perform multiple activities through the booked history like cancellation, printing, request for SMS, selection of alternative train by exercising the option of ‘Vikalp’ and even changing of boarding point if required. The revamped IRCTC website will go live today at midnight but if you would like to try out the new interface, head over to this link to give it a whirl. And don’t forget to tell us how you like it in the comments below.